Midnight Sun Provides Update On Solwezi Licences – Midnight Sun Mining Corp.
Vancouver, British Columbia, October 23, 2017 – Midnight Sun Mining Corp. (the “Company” or “Midnight Sun“) (TSX-V: MMA) is pleased to announce it has been notified by the Zambian Ministry of Mines and Mineral Development (“MMMD”) that a renewal has been granted on prospecting licence 21509-HQ-LEL for an additional four (4) years (plus further renewals) and a successful appeal to the Minister of the MMMD has been concluded regarding the renewal of exploration licence 12124-HQ-LPL. Midnight Sun is also currently working with Kam Chuen Resource Holdings Limited (“Kam Chuen”) in an effort to finalise a joint venture agreement. Kam Chuen holds the licences through its local subsidiary Zambia High Light Mining Investment Limited (“ZHLMIL”). 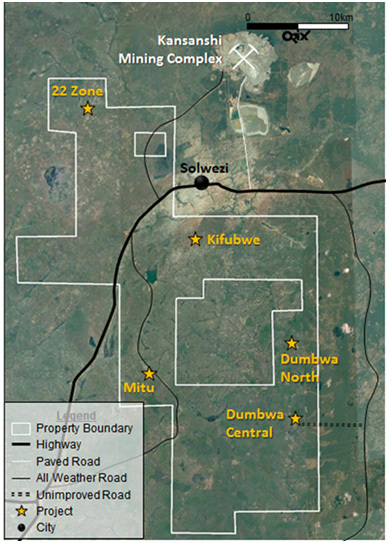 The Solwezi group of licences (collectively, the “Licences”) consist of two individual prospecting/exploration licences totalling over 506 km2 of ground and identified as 21509-HQ-LEL (formerly 14039-HQ-LPL) and 12124-HQ-LPL (as shown below in Illustration 1.0 – Solwezi Group of Licences). Licence 14039-HQ-LPL, one of the licences which comprise the Licences has been granted anew and is now renamed Licence 21509-HQ-LEL (“21509”). 21509 has been granted until March 1, 2021 with two subsequent renewals available, each for three-year terms, for a total of ten years with the option for future renewals providing the licence is maintained in accordance with the contained terms and the Mines and Mineral Development Act, 2015. ZHLMIL is to pay the annual area charges on or before the anniversary of the grant. The Company intends to commence an immediate renewal application process as per the condition(s) listed above, and is confident it will comply with all of the conditions imposed by the Hon. Minister of the Ministry of Mines and Minerals Development. In 2013, Midnight Sun signed a property option agreement with Kam Chuen to earn-in to a 60% ownership of the Licences through share payments and a graduated exploration program, with Midnight Sun as the operator. To date, the Company has fulfilled all of its obligations with respect to the property option agreement, and is currently completing its formal joint venture agreement with ZHLMIL. Mineralogy and Metallurgical Studies – in progress. The Company has identified several mineralized deposits within the Licences, and is continuing to advance the development of each of these areas to understand the size and scale of their potential. These areas are known as: 22 Zone, Mitu, Dumbwa (North and Central) and Kifubwe. 21509 includes both the high-grade 22 Zone and the Mitu discovery area. 12124 includes both the Mitu extension area and Dumbwa (North and Central). The Company will be conducting a geophysical exploration program on the Licences in Q4 2017 with the support of First Quantum Minerals Ltd. (“First Quantum”) (TSX:FM) as a part of their continued due diligence work (see August 18, 2016 news release). The geophysical program will focus on downhole EM (electromagnetics) and IP (induced polarization) to coordinate the drill results from the Company’s 2016 and 2017 drill campaigns, and ultimately provide additional information with respect to new drill targets for the forthcoming drilling season (c. April 2018 – December 2018). This current work program will be conducted primarily on the Mitu and Dumbwa targets. No obligation has been or is created between Midnight Sun and First Quantum as a result of this due diligence activity. The Company has extended the investor relation services agreement with Kaye Wynn Consulting Inc. (“Kaye Wynn“). Kaye Wynn has been engaged for an additional one year period at a rate of $1,500 (plus GST) per month. The Company will also grant Kaye Wynn stock options to purchase 350,000 Common Shares at the closing market price on October 20, 2017 ($0.315) for the term of their engagement. The stock options shall vest in accordance with TSX Venture Exchange (“TSX-V”) policies relating to the granting and vesting of Investor Relations Stock Options. The options are granted pursuant to the Company’s Stock Option Plan and the contract may be cancelled by either party with 30 days’ notice. The agreement is subject to TSX-V approval. Additionally, Midnight Sun has granted stock options to purchase an aggregate of 300,000 Common Shares of the Company, at an exercise price of $0.315 per share, to certain employees. The stock options are granted pursuant to Midnight Sun’s 10% rolling stock option plan, are fully vested upon issuance, and shall expire one year from the date of issue. This news release includes certain statements that may constitute “forward-looking statements” or “forward-looking information” within the meaning of applicable Canadian securities laws. All statements in this release, other than statements of historical facts, are forward-looking statements. The words ‘target’, ‘plan’, ‘should’, ‘could’, ‘estimate’ and similar expressions identify forward-looking statements. Forward-looking statements in this news release include, without limitation: statements with respect to the finalization of a joint venture agreement with Kam Chuen, statements with respect to the renewal process for 12124 and statements with respect to the proposed geophysical program on the Licences. Although the Company believes the expectations expressed in such forward-looking statements are based on reasonable assumptions, such statements are not guarantees of future performance and actual results or developments may differ materially from those in the forward-looking statements. Factors that could cause actual results to differ materially from those in forward-looking statements include, but are not limited to, changes in market conditions, unsuccessful exploration results, changes in commodity prices, unanticipated changes in key management personnel and general economic conditions. Mining exploration and development is an inherently risky business. Accordingly, the actual events may differ materially from those projected in the forward-looking statements. This list is not exhaustive of the factors that may affect any of the Company’s forward-looking statements. These and other factors should be considered carefully and readers should not place undue reliance on the Company’s forward-looking statements. The forward-looking statements are not guarantees of future performance. The Company disclaims any obligation to update any forward-looking statements, whether as a result of new information, events or otherwise, except as expressly required by law.